I land in Madrid and take a train to Barcelona, Catalunya. The heat is sweltering, the city is bursting with people, food, drink, culture. A five-day street party has just kicked off and I'm living with a friend in an alley way called La Luna. Niloufer Mavalvala Author and Founder Niloufer's Kitchen. E-cookbooks and blog writer, www.NiloufersKitchen.com. Culinary teacher. Traveller at heart. In the summer of 2009 our eldest daughter moved to Sevilla, Spain to study Spanish at a University for a semester. It was of course to master the Spanish language and experience living like a local first hand -- which she managed to do thanks to her wonderful host mother, who spoke absolutely no English! A few weeks later, my husband and I were fortunate enough to travel to Spain to meet up with her; we visited Marbella, Granada, Sevilla, and Madrid. Everywhere we went, the people were warm and friendly, the architecture and history intricate and interesting but it was really the food that made my heart jump for joy. Eating tapas every day, twice a day inspired me to come home and revisit the art of making tapas in my own kitchen. My daughter returned from Spain having learned Spanish rather fluently, inspired me to try out all her favourite dishes, which she was now missing. As I recall every bar in every city served tapas and every street had some form of an eatery. It seemed that the Spanish (like many of us) centered their lives around good food and drink, but with an artistic flair few others have the time or the inclination to try. Below is my daughter's account of her time in Spain. "How Spain stole my heart..."
I land in Madrid and take a train to Barcelona, Catalunya. The heat is sweltering, the city is bursting with people, food, drink, culture. A five-day street party has just kicked off and I'm living with a friend in an alley way called La Luna. We weave through webs of people and alleyways, eating free paella and drinking cheap caprinhas. Sleep is not an option tonight. 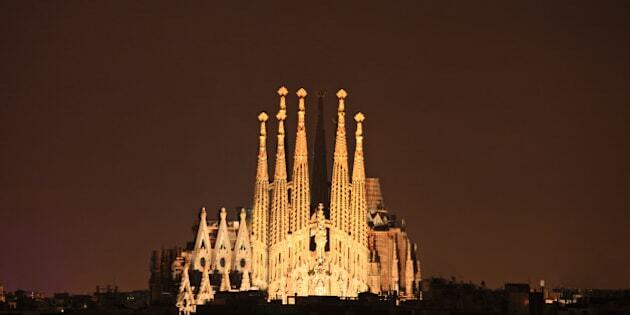 The night becomes morning and it's time to explore Barcelona's icons. First stop, La Boquería, the marketplace off Las Ramblas is this foodie's dream come true. Fresh fruit juices for €1, cut fruit in packages, a thousand breads, hundreds of cheeses, and tuet (regional cured sausages) hanging from the stalls. I'm not taking deep breaths because the fishmongers are everywhere. In between covering the basics, La Sagrada Familia, Park Güelle, Casa Mila, Plaça Espanya , we're eating Barcelona. Walking through the Latin Quarter we visit a little cafe where tapas come and go with the beer we've ordered -- there is no menu, just a flow of food that will come until you are ready to leave. Pimientos padrones, patatas bravas, croquettas, chorizo con everything, jamon serrano, and tortilla de patatas fill you up slowly but surely. Before I go, I make sure to eat crema catalana (local caramel custard). It's sad to leave Barca, but the next top is Sevilla, Andalucia, my new home for the months to come. After a train journey south across the country, I reach Santa Justa Sevilla and take a taxi through the traffic-less, winding streets to Calle Ubeda, where my host family lives. I arrive on a quiet street -- it's siesta hour. After a quick rest, excitement carries my legs to take a walk. In a matter of minutes the magnificence of Alcazar, La Giralda and Cathedral surround me. There are plazas with cafes and restaurants, and narrow streets full of shops and homes everywhere. In the days and weeks to come, pan con jamon y tomate (bread with olive oil, crushed tomatoes and serrano ham), manchego cheese, boquerones (fried bait/anchovies), and patatas bravas are staple foods, but I'm spoiled for choice -- from Las Rayas for helado (ice-cream), Levies Café for the best choice of cheap tapas, El 3 De Oro for assorted fried seafood served in a paper-cone, to the riverside stand selling churros con chocolate. In the evenings, local bars are bustling full of friends and family drinking copas (€1 cups of local beer), clara (beer mixed with lemonade) or tinto de verano (red wine with Coke). At home, Pepi -- my host mother, serves up fried fish, lentils with chorizo, or crushed cauliflower, garlicky green beans or ratatouille, topped with fried eggs, as we watch our favourite Spanish drama -- La Señora. On a Thursday night out, I'm with friends at La Carbonería where traditional flamenco dancing takes place in a crowded cave, flowing with jugs of agua de Sevilla (a local piña-colada type drink). My travels take me to Córdoba and Granada where I my taste buds venture. In Cordoba I try a local tomato-based gazpacho called salmorejo, albondingas (meatballs in sherry wine) and berenjena con miel (fried eggplant in honey and treacle). In Granada, I dine at a Moroccan restaurant that is not so out of place given their long history in Spain. Finally, I make my way back to Spain's capital, Madrid, to explore this multicultural and cosmopolitan city that seems unusually large and spread out after weeks of exploring small Andalusia's townships. Here, in addition to the brilliant bakeries, pastelerías, markets, and tapas bars, there are restaurants with food from around the world. At a Chinese restaurant, I watch the noodles in the dish I've ordered being made in front of me. I later stroll in the morning as I grab a French croissant with jamon serrano before my trip home. And just like that, Spain stole my heart.